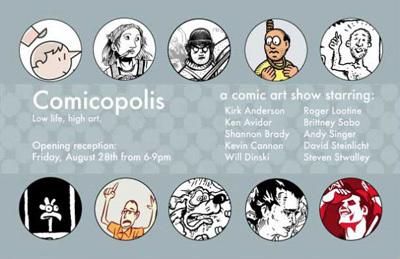 Comicopolis, a gallery show featuring the work of a number of Minneapolis cartoonists (including me) opens this Friday… hope you can make it! Please join us Friday, August 28th for food, drinks and music! Wanna help promote the event? Have a chicklet! 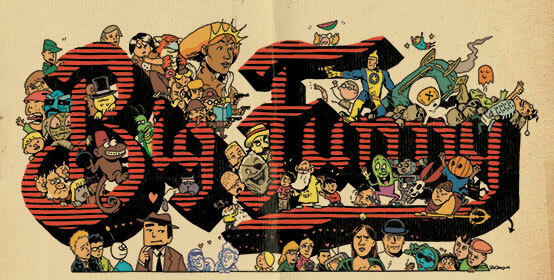 The show premieres BIG FUNNY, an oversized 48-page newspaper of comics by 45 different artists, inspired by the funnies sections of yesteryear. The gallery show features original art from the publication, numerous antique comic strips (some over 100 years old), a retrospective of unknown cartoonist William Ede, and an old cigarette vending machine rigged up to sell small boxes of little funny mini-comics. Hope to see you there!